Here’s my first project using conductive thread. Using the Sew Electric kit, I made a bookmark out of crafting felt, sewing a battery inside that lights up an led. Instructions for this project and others are available on the Sew Electric website. For this particular project, you don’t actually need the kit. You could just head to your nearest electronics store for a few bits. Lee’s Electronics in Vancouver is my favourite. The staff at Lee’s helped me order my Makey Makey kits and pull together enough very basic supplies to do a little project with coin batteries and mini LEDs. The staff were not only patient with my lack of understanding, but they were excited to hear teachers wanted to experiment with circuits in classrooms. 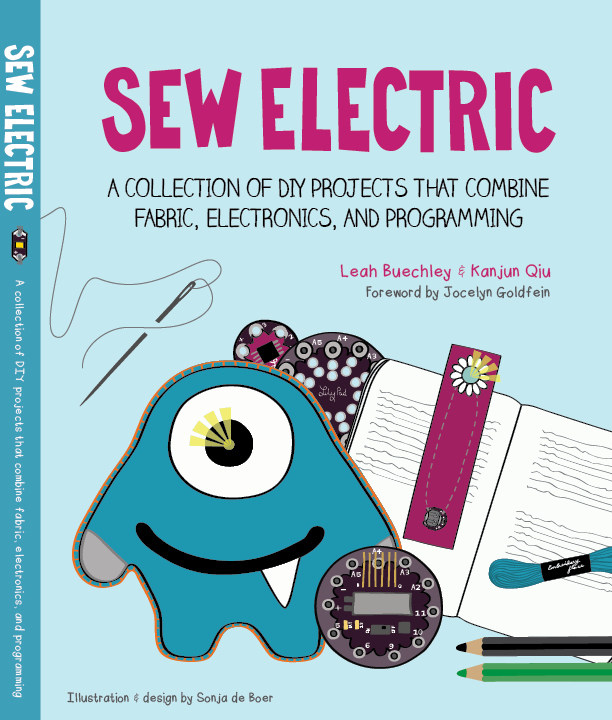 The Sew Electric Kit has very fun projects, including ones where you use a Lilypad arduino board that you need to program, and comes with all the supplies you need for the circuitry. This looks like so much fun, Jen! Sewing is my main hobby other than reading and I’d love to try experimenting with conductive thread.